Not many of us will have the opportunity to attend or participate in a live web-related event, conference, or presentation. But that doesn’t mean we can’t benefit from the information exchanged at such events. Many of the sites associated with those events provide supplementary information, summaries, presentation slides, plus audio and video footage from the presentations given. In this article I’ve assembled a short but diverse list of presentations related to design and development that I think everyone will find both informative and entertaining. I’ve included a brief description of each presentation, along with some notable quotes and related links. The final presentation in this list is a tongue-in-cheek performance that is a must-see for anyone involved in web development for the past 5 or 6 years. This presentation was recorded on October 9, 2009, at Web Directions South in Sydney, Australia. Kevin Yank of SitePoint discusses what CSS frameworks do, how to choose a CSS framework, along with some of the pros and cons of four types of CSS frameworks: CSS resets, grid-based frameworks, “pre-fab” frameworks, and frameworks that use CSS abstraction. This talk took place on February 27, 2009 as part of the Google Tech Talks Web Exponents series. This talk took place on November 23, 2009 as part of the Google Tech Talks series, and is based on Professor Hearst’s book Search User Interfaces. 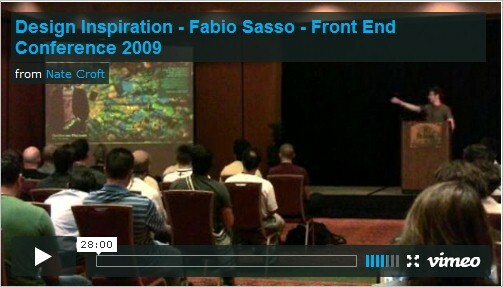 This presentation by the owner of Abduzeedo, took place at Front End Design Conference on July 31, 2009. Sasso discusses his personal sources of design inspiration and includes some interesting comments on the challenges facing Brazilian designers in today’s market. An older presentation from Future of Web Design 2007. A very funny, and thought-provoking panel discussion covering a number of topics including the recent trend of developers working more on personal projects, plus some thoughts on web standards, web design education, dealing with clients, and more. This presentation by Eric Meyer took place on November 5, 2009 at Build Conference. Meyer discusses universal uses for HTML and CSS, the death of the browser plugin, and shares an interesting viewpoint on the proposed completion date of 2022 for HTML 5. This presentation took place in March 2007 at SXSW Interactive. This is an absolutely hilarious and well-prepared presentation by two of the most notable names in web development. A must-see video covering web 2.0 buzzwords, design, fonts, web 2.0 bingo, and more. The hour closes with a serious summary of the impact of web 2.0, what it really means, and what direction it should go in. Louis Lazaris is a writer and freelance web developer based in Toronto, Canada. He has 9 years of experience in the web development industry and posts articles and tutorials on his blog, Impressive Webs. You can follow Louis on Twitter or contact him through his website. Great videos for those who couldn’t assist to these good conferences. Really nice collection, Ive been waiting for this kind of post.. great share..
Great collection of presentations! I’m working my way through them now. Thank you for including Fabio’s wonderful presentation at the Front-End Design Conference. Wow you have some really great thoughts here! I have to say that these videos are not only engaging, but you can learn about web design and technology with these. Way to go keep up the great posts! Videos are truly the easiest and fastest way to learn. When you are actually seeing the parts go together it makes everything click. I can’t get enough of these. Very true, good point. I think we writers and bloggers tend to use the words “design” and “development” interchangeably too often. But don’t forget that “design” is not limited to “graphics”. Design includes “UI design”, “UX design”, and “CSS design”, all of which are covered in the videos. Really nice will check them out sooner or later. Thanks! I’ve just listened to Kevin Yank’s video about CSS Frameworks–on my vacation, Didn’t even want to pause to refill my coffee! I’m definitely going to browse through the rest of the collection, too. This page must be bookmarked. Great content. Thx for the post. Great list of videos, thanks for compiling them! Haven’t gotten through them all yet, but I’m working on it! Great post and thank you for the videos! The intervention from Fabio Sasso is really interesting. His blog Abduzeedo is one of my favourite. haha, Eric Meyer has now long hair :)) Not bad dude. I haven’t seen him from his CSS video Lynda tutorial, made in 2003 I guess. Those videos are classic. I’m hitting up SXSW this year for the first time. Hope to hear some more memorable quotes there. unfortunately Meyer lost his point or he didn’t came up with something clear in his mind. I almost drop off at the middle of the movie. The notable quotes here are inspiring and motivational. Thank you. I had certain not to answer back any article in the community, but I read your news, I told myself this information is actually need to answer!As this is so a extremely good information! It is so blessed for me to read this article. Nice posting. Thanks for this information. Thanks to you, that is what I have recently been browsing for and a successful Aol search found your web page and so here I am. This is a great resource…a little outdated but useful none the less.